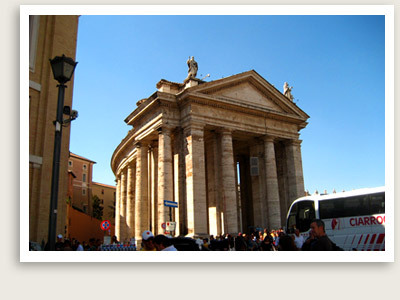 Option: Customize this Rome and Amalfi tour package or fully design your own. Amazing art, history, architecture plus breathtaking sceneries, fabulous food, fantastic accommodations and excellent guides await you on one of the most enjoyable escorted tours of Italy, our Rome and the Amalfi Coast tour. 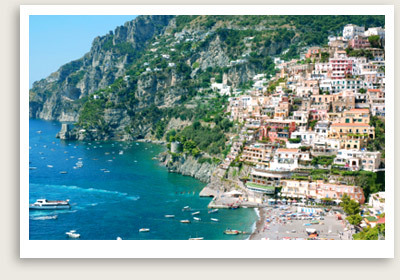 Join Well Arranged Travel’s Italy small group tour of Rome & The Amalfi Coast. Your will first have three days of Rome escorted tour, where you will see the ancient wonders that have drawn visitors to this capital for centuries: the Colosseum, St. Peter’s Basilica, the Vatican, the Sistine Chapel, Trevi fountain, Piazza Navona, Pantheon, Spanish Steps and more. This Italy group tour will then continue on to the picturesque Amalfi Coast, stopping for a private tour of the lost ancient city of Pompeii and Herculaneum en route. You’ll tour the famous seaside resort towns of Positano, Ravello and Sorrento, and also do excursions to the town of Amalfi on the gulf of Salerno. You may also ferry over to the sun-drenched island of Capri. Truly one of the best and most rewarding tour of Italy. Join us on our tour of Rome & The Amalfi Coast. Inquire about our complete Italy vacation packages. Note: Activities or order of activities are subject to change due to unforeseen closures, etc. We reserve the right to replace an activity. Once you arrive in Rome, you driver-guide will meet you at the airport. Your Rome and Amalfi Coast tour begins with a driving tour of Rome. 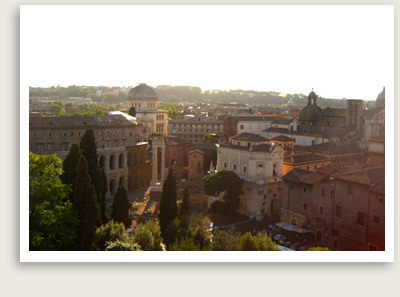 Rome is quite large and a comprehensive panoramic driving tour or Rome is in order. Your guide will whisk you through all of the city’s most important neighborhoods and sites, from the ancient to the modern. Some of the sites that may be included are: Spanish Steps square, you quickly reach one of the most famous balconies of Rome, Pincio Terrace. From here you can see above Piazza del Popolo, one of the most elegant squares in Rome, with its obelisk, the Twin Churches. Your driving tour of Rome will continue on to Via del Corso, the commercial artery of Rome, full of shops, banks and governments buildings like the Palazzo Chigi, home of the Prime Minister’s office. Here you will see the largest square in Rome, Piazza Venezia. Here you will see Palazzo Venezia, the headquarters of the Fascist party and Mussolini, as well as the Vittoriano, a huge monument dedicated to the first Italian King, Vittorio Emanuele II. From Piazza Venezia, your Rome guide will take you toward the Colosseum, in the heart of ancient Rome. 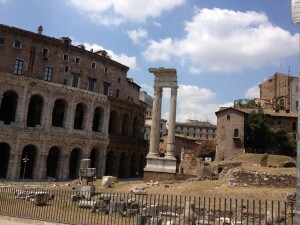 First you will see the ruins of the Trajan Forum and the Trajan Market, followed by the Caesar Forum and Augustus Forum. During the weekday, it is possible to walk on the ancient Appian Way and see Rome’s ancient gate and wall. This private tour of the Colosseum and Roman forum is a must for first-time visitors to Rome. The Colosseum was the entertainment center of ancient Rome. Here, 50,000 people gathered to watch gory gladiator contests. In your Colosseum tour, you will hear about amazing 450 years of history here, and get a sense of how Romans celebrated the best and the worst of their society, influenced by the emperors’ overwhelming powers. Your tour guide will bring the relics of the ancient Roman forum, dating back to 6th century BC, to life as you traipse through the ruins of numerous temples, churches, palaces, arches and shops. The first Roman civilization began here, in turn becoming the administrative and commercial center of ancient Rome. Your tour guide will also cover other sites of Ancient Rome such as the Arch of Constantine and Piazza del Campidoglio, designed by Michelangelo. Your Vatican tour today includes the Vatican museum, Sistine Chapel and St. Peter’s Basilica. 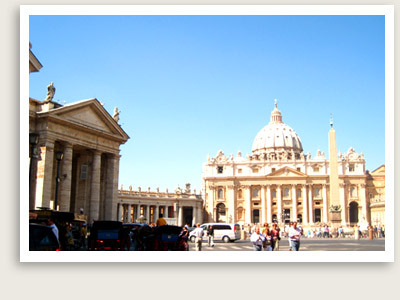 Your Rome tour guide will fetch you from your hotel and travel with you to the Vatican. You will skip the long line and enter with your pre-arranged appointment. The Vatican houses the wealthiest privately-owned collection of masterpieces, showcased in rooms with walls decorated by Raffaello. The real masterpiece, however, is next door: Michelangelo’s painting of the Sistine Chapel, which unexpectedly revolutionized the world’s idea of art. The Sistine chapel is still shaping the future of the Papacy: this is where the cardinals lock themselves in to elect a new Pope after the former one has passed away. NOTE: A visit to the Egyptian rooms, complete with a couple of mummies, may be of interest to the younger visitors. For art lover’s Raphael’s room may be added but you will need an additional hour. A 4-hour tour is needed in this case. Our standard Vatican tour is 3 hours long. Your Vatican tour ends with the tour of St. Peter’s Basilica, the largest church in the world. The magnificent and breathtaking complex spans back to 4th century BC, when it was commissioned by Emperor Constantine, though the new cathedral took over 100 years and all of Italy’s greatest artists to build it. NOTE: Vatican Dress code (covered knees and shoulders) to enter St. Peter’s Basilica is strictly enforced. Private transportation will take you to Sorrento. On the way, a tour of Pompeii and Mt. Vesuvius is planned. Your Pompeii tour is conducted by an expert guide. 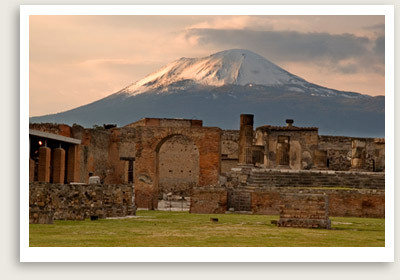 You will hear the fascinating history of Pompeii and its people. Thirty feet of hot mud and volcanic ash buried this ancient Roman city completely when Mt. Vesuvius erupted in 79 A.D. Your guided Pompeii tour will be conducted by our excellent tour guide who will take you through this once-prosperous city, established in 12th century B.C. You will see villas, baths, storefronts, houses with frescoes, courtyards, pizza parlors, forum and other artifacts from Pompeii’s heyday. It is only fitting to have a look at Mt. Vesuvius. You will do this after a nice lunch stop. As always, dinner suggestions will be provided. Your driver guide will pick you up from your hotel and take you on one of the most memorable day tours in Italy, to the beautiful Amalfi Coast. Positano and the town of Amalfi are the planned stops. This Amalfi Coast tour affords you relaxing walks along the elegant streets of these two world-famous holiday seaside resorts, rich in history, fashion and spectacular views. Your Amalfi Coast tour will start in Positano. The laid-back town of Positano offers many photo and shopping opportunities, between its multi-colored houses clinging to the cliff face overlooking the bay, and the fashionable boutiques and cobblers’ shops along its pedestrian main street. Your next stop in this private tour is Amalfi, a UNESCO World Heritage site featuring the St. Andrea’s Cathedral, whose 57 steps will reward you with a great workout and a great view. The city is also home to the Museo della Carta, which introduces you to the art of paper making for which Amalfi is known. This morning, you will take a ferry over to Capri. This guided Capri tour takes you on a private tour of the picturesque island of Capri via a hydrofoil ferry (car/van from Rome then ferry). 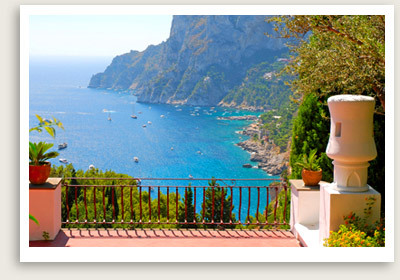 A popular resort since Roman times, the beautiful island of Capri is a joy to explore on foot. You will explore this gorgeous island with your guide. Your Capri tour will also take you to Anacapri, the island’s other main settlement, From its main square, Piazza Vittoria, you can take a chair lift up to Monte Solaro, the island’s highest point, where you can have an incredible view of the island and visit the ruins of a castle. You may include a visit to Villa San Michele while in Anacapri. This former home of Swedish writer and healer Axel Munthe, this villa features lush gardens and a house full of Roman treasures. You’ll also have time to make some one-of-a-kind purchases in Capri’s world-class shops, and take in the breathtaking views from fun outdoor cafes, before taking the ferry back to Sorrento. 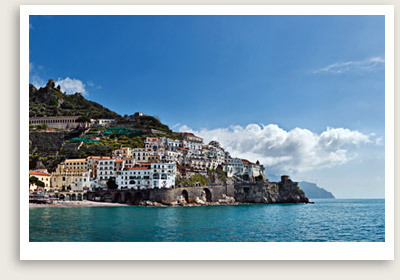 This is the last day of your Amalfi Coast tour. Explore Sorrento this afternoon. You may visit a lemon and orange grove located in the heart of the town where you can sample limoncello. A treat for the eyes, nose and mouth! Prepare for your flight home. A private transportation will take you to the airport.